I am such a lucky gal. This summer, my family (parents, my brother and his wife, and my little family) took a summer vacation like never before. It was not quite a page out of Planes, Trains and Automobiles, but it sure did have its comedic moments. We flew from Dallas to Albuquerque, then drove to Durango where our final destination was a cabin in the woods near the Kennebec Pass. The entire drive through New Mexico, Luke, the 5 year old (going on 18) was huffing and puffing about New Mexico and how he didn't particularly care for the state. How could he not care? Breaking Bad was filmed in this glorious place. It has heart, it has passion, it has...CASINO's! I digress. About every 15 minutes, Luke asked us if we were in Colorado yet. 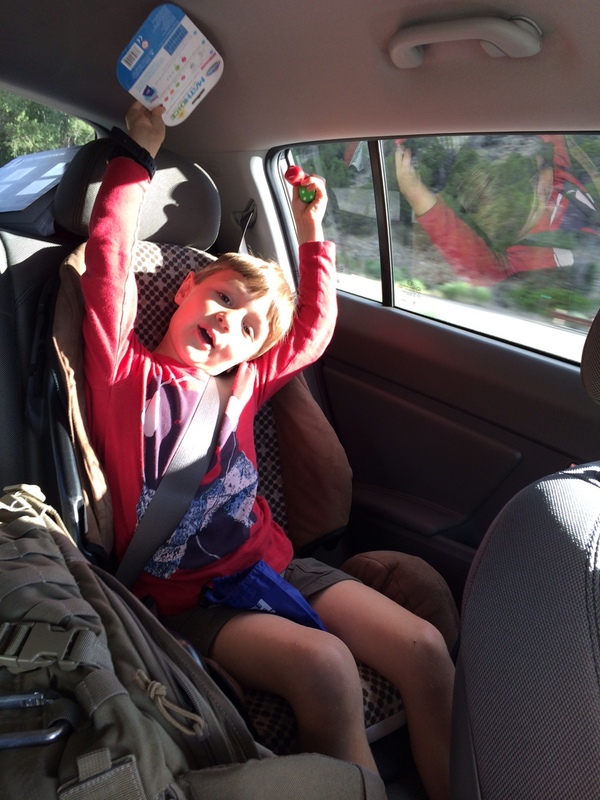 And to my surprise, when we crossed state lines- the sweet kid basically jumped out of his car seat! Meanwhile, the baby looked like this. Upon our arrival, there were vast views of mountains, trees, and even a little snow. I am telling you people, Durango is one of the best places to vacation during the summer months. Not only was the little town square quaint, but it wasn't nearly as crowded as I had originally thought. There are places to rent Jeeps, go water rafting, zip lining, and wall climbing. You can even drive a mere thirty minutes East and visit the base of Purgatory where they have a great little burger joint and tons of activities for kids! Needless to say, this was truly a most fantastic trip!